April 2011 | Matthew Brookes - Internet, SEO and the recruitment industry. With the advent of social networking and smart phones with global positioning satellites (GPS) capabilities, a unique opportunity opened up with the rather boring world of mapping and navigation. 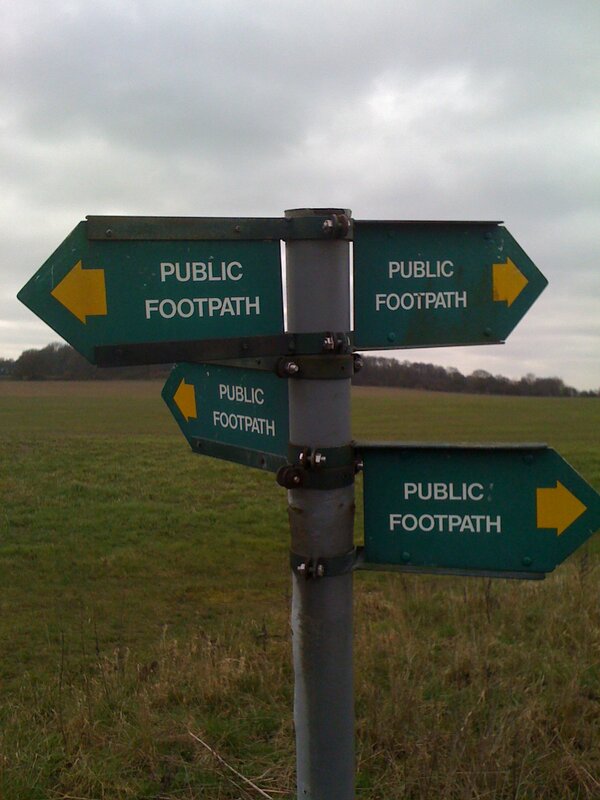 I have always enjoyed hiking and camping so from a very early age have been able to read a OS or road map - this is a very useful skill as technology does not always have the answer. Still for day to day stuff life should be easier. Back in 2007 my then Nokia N95 not only did it have a great camera for a phone but also a GPS which when combined with the rather poor mapping software could sort of tell me where i was heading. It also had some software for tracking when i went out walking or cycling. This was the first time I had used any personal GPS software other than when my Dad used his TomTom in the car, and i thought it was great even if a bit clunky. The appearance of on-line tools like Google Maps also meant you no longer had to think how long should it take to get from A- B or which route should i take, a quick search and there was the result (now with traffic info) which cold be printed out and used on your next journey, I sort of feel sorry for the AA route planner which up until Google Maps was the best directions your could get ( some would argue still is). Fast forward a couple of years and armed with a nice new Iphone 3G with proper web browser and Apps! a whole new ball game was under way, first i used the built in Google maps software this was fun and a massive improvement on the Nokia i could even plan a route and the GPS could track me along the road, ace! The real problem i had though was no voice commands and you are not allowed to be driving fiddling with your phone so voice was a major feature missing for me, it was also around this time i found out about the Open Street Map project. This is a crowd sourced mapping project which on looking back at today, is fantastic providing a easy way to include mapping information with your apps or teach people about mapping. The project introduced me to crowd sourcing and the social aspect to mapping here were hundreds if not thousands of people around the world contributing on a daily basis to improve everyone's understanding of the places they lived in as well as useful mapping information. After using Open Street Map for a while and realising their API could be used for a mapping application i stumbled across Skobbler. This app did exactly what i was after provide routes to destinations with voice commands, bingo! After using the app for a while i started thinking with all this mapping data at Open Street Map and Skobbler using it to provide me with directions wouldn't be good if while using the App i could provide data back to them so as to improve things?? 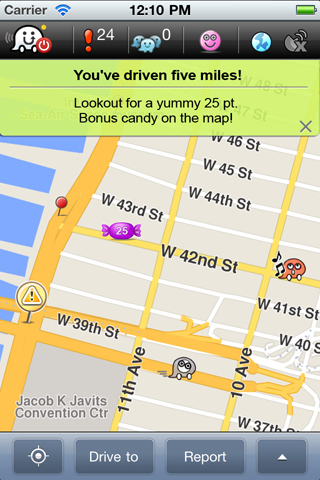 Well as luck would have it one of my friends (@AlexBuchta) brought to my attention Waze. 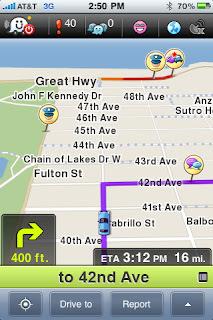 Waze is the social way to user generated navigation. Unlike Skobbler when using Waze you are building the map as you travel! In some ways this is a little scary you would think a navigation app was supposed to already know the way. However the more you travel the the better the maps get the more people that use the app the better the app gets and the best bit is the gaming aspect. As you build up more points you get to customise your character a little as well so you can pick a different type of vehicle or select a mood based on how you are feeling that day (generally hungry I find). 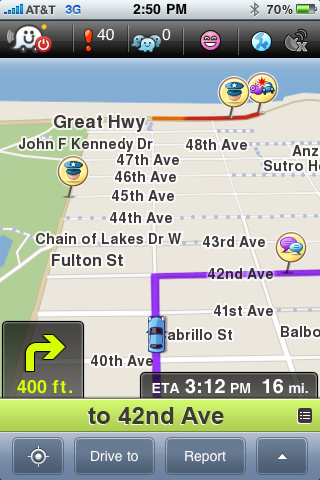 If you start using the App in an area not know by Waze no problem you can plough the roads as you dive. Its fun when you suddenly find out someone else is using the App and all of a sudden two parts of the map join up its at this point the App gets more useful as the work you have been doing helps all those other Wazers out there. As you can see from the screen shots Waze is international as well so you take it on your travels but don't forget your international phone tariff! So once you have you local area planned out and a few long journeys under your belt what else does the app do? It can give you voice directions on your journey, travel certain routes regularly it learns this and offers up guidance on your journey, the first time the app did this was a little scary and I was a bit disappointed at being so predictable! As its a community based App you have the ability to report various different things on your travels. Be this traffic jams, accidents, police etc. It even allows you to take a photo and upload this. All this info goes back to some super type computer I guess and with the help of an algorithm it means Waze can alert other travellers to potential problems, this gets you from A- B in the quickest time! They provide different goodies depending on the time of year and certain special occasions such as Easter, Valentines or Christmas which keeps things interesting as you travel around its not too often you spot a Easter egg or present sat in you path and these give you bonus points. If you live in an area where there are lots of people using Waze you can join groups this means you can get updates from the people around you which also means the traffic info is really relevant and up to date. 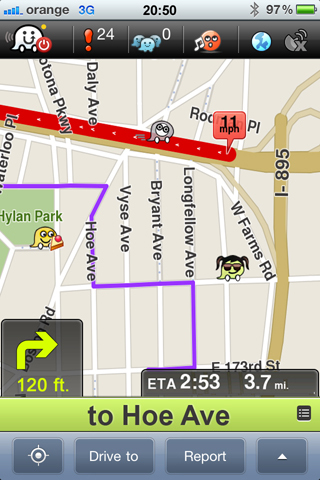 So far Waze has been the best Free App I have found for car navigation. It might not have all the roads pre-mapped out but that's part of the fun, the simple points system keeps things interesting, but the best bit is the community and they way the more people us it the better the maps, directions get. points of interest - by this I mean services on the road it would be great to get a head up on petrol stations or the next place I can find a toilet. In App ads - little odd but often when travelling it would be good to be able to get a deal on something, not to many mind you!! I would also like to see a time lapsed video of the UK Waze map forming, I think this would be really interesting as you could try and spot which parts of the country were early adopters.